Callum Sheedy (Bristol) is shown a yellow card. The referee awards a penalty try to Exeter. Exeter have won 100 rucks so far this game. Callum Sheedy adds the points for Bristol. Exeter have won 80 rucks so far this game. Jack Yeandle makes the break as the defence re-enacts the parting of the red sea. Exeter decide to make a substitution, with Elvis Taione getting some game time. Exeter decide to make a substitution, with Jack Yeandle being replaced. Gareth Steenson curls the ball too far, missing the posts to the left. Don Armand played a key part in that try. A series of passes by Exeter results in a try for Jack Yeandle. Bristol make a substitution with Joe Joyce coming on. Bristol make a substitution with Nick Haining coming off. Bristol sub Jake Woolmore comes onto the field. Yann Thomas departs for Bristol. Daniel Thomas has made 10 good tackles so far this game. Tom Lindsay comes on for Bristol. Shaun Malton leaves the field. Callum Sheedy has made 10 good tackles so far this game. John Afoa has made 10 good tackles so far this game. Bristol have won 120 rucks so far this game. Will Hurrell has made 10 good tackles so far this game. Callum Sheedy has hit the cross bar with his penalty goal attempt!. Exeter decide to make a substitution, with Sam Hill getting some game time. Exeter decide to make a substitution, with Alex Cuthbert being replaced. Exeter make a substitution with Wilhelm van der Sluys coming on. Exeter make a substitution with Mitch Lees coming off. Exeter have won 60 rucks so far this game. Gareth Steenson does the business as his conversion attempt goes over. Fabulous play by Exeter has led to Santiago Cordero being able to wriggle through a gap. 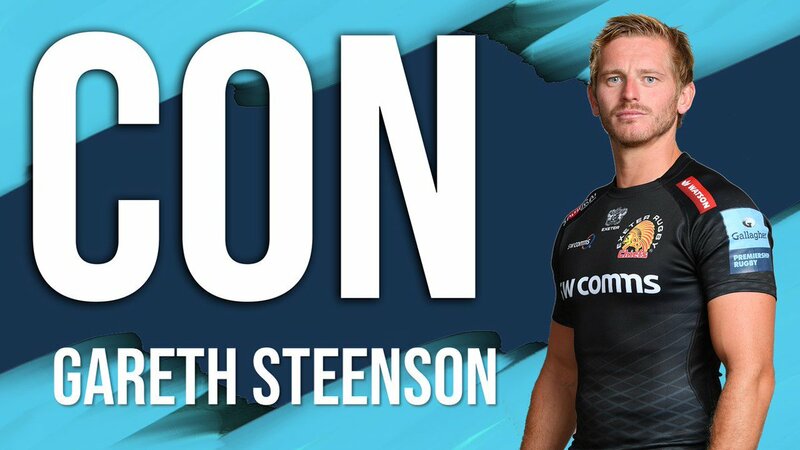 That's a great try assist by Gareth Steenson. A stunning solo try from Santiago Cordero. Exeter sub Dave Dennis comes onto the field. Ollie Atkins departs for Exeter. 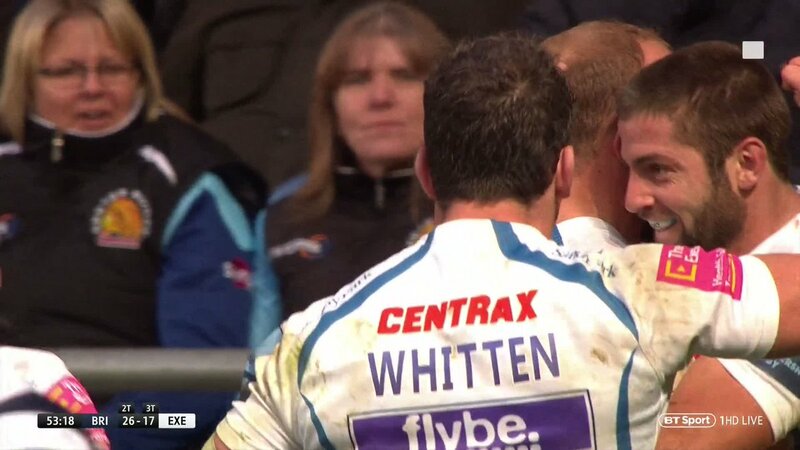 Nic White comes on for Exeter. Stu Townsend leaves the field. Callum Sheedy makes no mistake with that conversion attempt. John Afoa sets up the try. Great hands by Bristol leads to a try for Luke Morahan. Trouble here as Luke Morahan breaches the defence. Tom Lawday has made 10 good tackles so far this game. Mitch Lees has made 10 good tackles so far this game. Bristol have won 100 rucks so far this game. Ollie Devoto has made 10 good tackles so far this game. This is dangerous for the defence as Santiago Cordero bursts through to advance the Exeter attack. Don Armand has made 10 good tackles so far this game. Exeter have won 40 rucks so far this game. A gap opened in the defence and Ian Whitten took full advantage. Jack Yeandle has made 10 good tackles so far this game. Bristol have won 80 rucks so far this game. Matt Kvesic has made 10 good tackles so far this game. The defensive line has been broken as Charles Piutau goes through the gap. Ollie Atkins has made 10 good tackles so far this game. Callum Sheedy converts the try. Charles Piutau scores the try from close range. Greg Holmes has made 10 good tackles so far this game. Bristol have won 60 rucks so far this game. What a run here by Nick Haining as they gets over the gainline!. Gareth Steenson has hooked the conversion to the left of the posts. Tom Lawday makes the break as the defence re-enacts the parting of the red sea. The Exeter pack has powered over for Tom Lawday to score the try. Callum Sheedy does the business as his penalty goal attempt goes over. Exeter have won 20 rucks so far this game. Bristol have won 40 rucks so far this game. Callum Sheedy makes no mistake with that penalty goal attempt. Fabulous play by Bristol has led to Callum Sheedy being able to wriggle through a gap. Trouble here as Yann Thomas breaches the defence. Callum Sheedy kicks the penalty. This is dangerous for the defence as Will Hurrell bursts through to advance the Bristol attack. Bristol have won 20 rucks so far this game. A gap opened in the defence and Tom Lawday took full advantage. Gareth Steenson has kicked a conversion. Exeter are only a few metres out, surely they must score! And they do with Moray Low touching down. Callum Sheedy has kicked a penalty goal. The defensive line has been broken as Andy Uren goes through the gap. RT @btsportrugby: "I'm satisfied he always had possession he wasn't tackled... It's a try for me." RT @btsportrugby: Tom Lawday storms through and Moray Lowe scores Chiefs' first try of the afternoon! 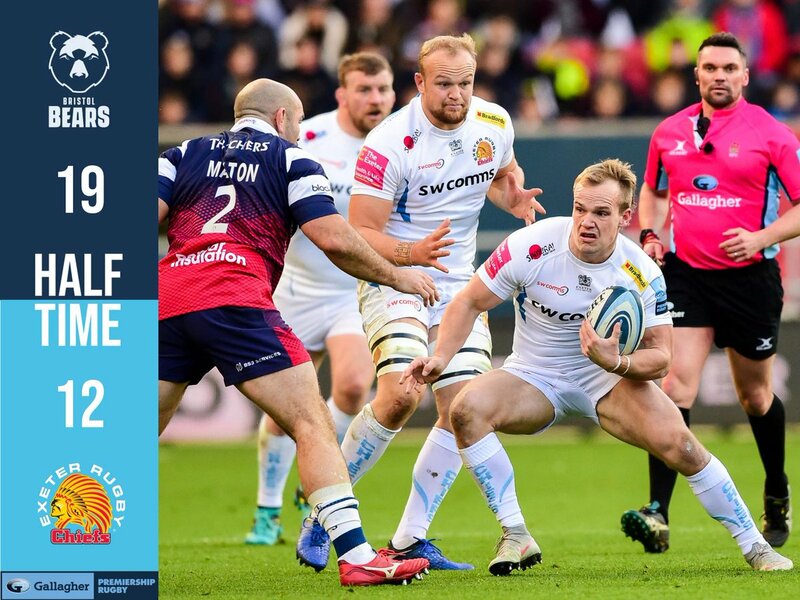 RT @BristolBears: Thanks to @ExeterChiefs' players, supporters and staff. 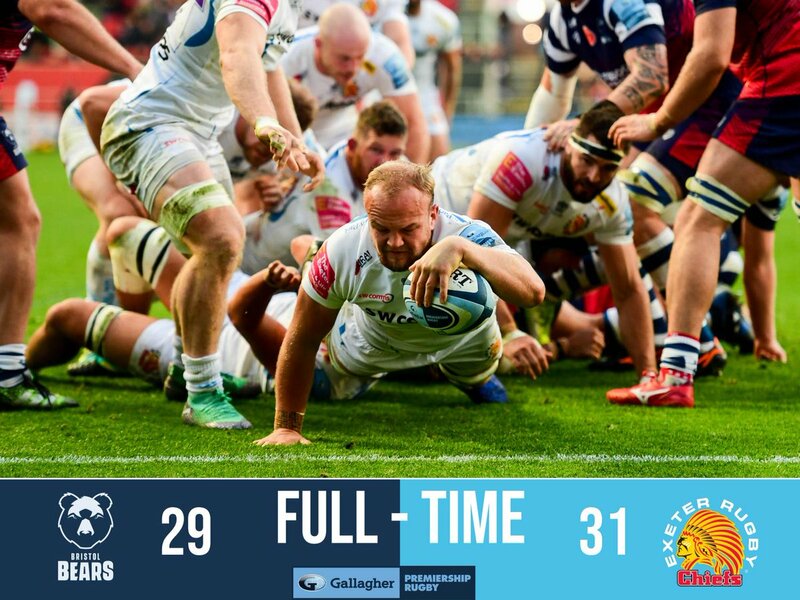 Huge credit to @BristolBears - pushed @ExeterChiefs all the way. 80+3 It was a 13 man maul and dragged down by Bristol, or coming in from the side. 70 TRY Chiefs. Neat 2 ball at the lineout and then a peel round the front puts @Yenz_2 over in the corner. 58 Sheedy hits the post. The following player cannot gather cleanly. Chiefs scrum 5m out. 47 Bristol forward pass (not so sure about that myself) in their 22. Time for Chiefs to wake up. White on for Townsend.